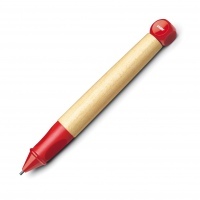 Child's pencil made from maple wood with non-slip rubber coated gripping section. Can be personalised with supplied stickers. The pencil uses chunky 1.4mm pencil lead so easy writing for young hands. Twist continuous propelling mechanism.